My tropical research is currently conducted globally but mostly in Papua New Guinea in Binatang Research Centre. All my research focuses on different aspects of communication between insect, plants, and predators of insect. I work with importance of predation at different habitats. My previous research in temperate was on birds and their recognition of predators. Later, I continued with recognition of partly occluded and amputated predators - so called amodal completion. These experiments were conducted during Bachelor and Master studies at Faculty of Science of University of South Bohemia, University of South Bohemia in České Budějovice. The island of New Guinea contains the third largest remaining area of tropical forest wilderness next to the Amazon and Congo basins. It is estimated that New Guinea supports five percent of global biodiversity whilst it covers less than 0.5% of earth’s land area. Large enough to generate its’ own species diversity, New Guinea is regarded as a ‘mini-continent’ with high proportion of endemic species, not found outside the island. In plants for instance, the proportion of endemic species exceeds 70% of all species. New Guinea is especially famous for its avian diversity and occurrence of many endemic bird species. Despite the interest of many ornithologist and biologist, there is still many poorly described bird species. The only information is usually old, not accurate or completely missing. Our previously finished field work in Papua New Guinea provided a rare opportunity to study undisturbed remote ecosystems along the entire altitudinal gradient of Papua New Guinea. We managed to record more than 260 bird species. Now, we would like to share gained experiences and knowledge online. We would like to provide description of species, their photos, voice recordings, actualized maps of area, and recent altitudinal distribution. We also plan to get genetic information on most of mist-netted species. 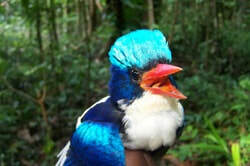 Our aim is to publish information about all bird species breeding in Papua New Guinea and surrounding islands. It means 719 species. We would like to publish all informations via Encyclopedia of Life where I received Rubenstein Fellows program for 2012. Papua New Guinea has the highest number of languages in the world. However, nobody knows how well the new generation of Papua New Guineans speak their local languages. As I study the birds of New Guinea, I started to collect local names of all birds in areas where I worked. Later, we found that we can actually test how well the people in the villages know the local names of birds. Once the lists were collected, we were able to go back to the village and make questionares. This work was further led by Nigel Baro, UPNG student based in The New Guinea Binatang Research Center. He also extended the work on birds to local plants and currently also to body parts, and try to find out how well the local people can speak their local languages. An interview about the project on the Radio Australia (in Tok Pisin).